One of the other practice sessions at the F1 Singapore tracks. 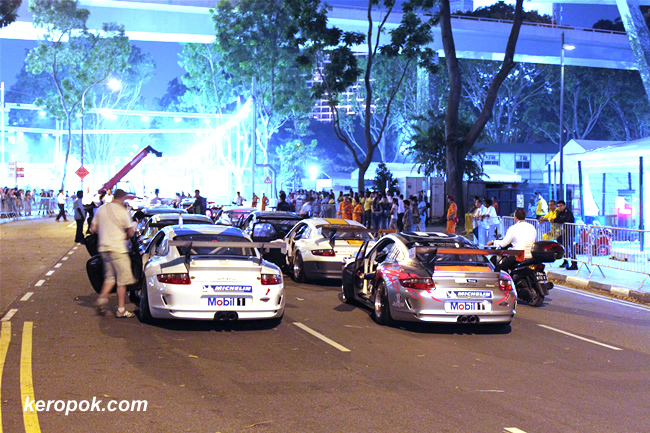 The Porsche Carrera Cup Asia practice session. For this, you can get near to the cars without the expensive paddock tickets. haha.. But it was good to see them. i wonder where they headed to? Wow, lotta millionaires in SG, yes ? Actually it's crazy to use such an expensive car for a race that involves risk, dont u agree ? When the carbon-emissions tax r enforced, it will cost a Porsche a few thousands euro's extra to be on the roads here. Is SG going the same way ?